Landscape architects across Canada turn to PlayPower Canada when they need site furnishings, shade equipment and other options they love to incorporate. If you’re a landscape architect, you’ve likely seen PlayPower Canada equipment in parks, communities and spaces across Canada. Whether you’re looking for landscape benches or other special pieces for a project, PlayPower Canada is an excellent choice. We help you find the landscape site furnishings and options you need to help your urban or rural project succeed. Our pieces help make your area a more pleasant place to spend time because our benches and tables encourage visitors to linger and relax. 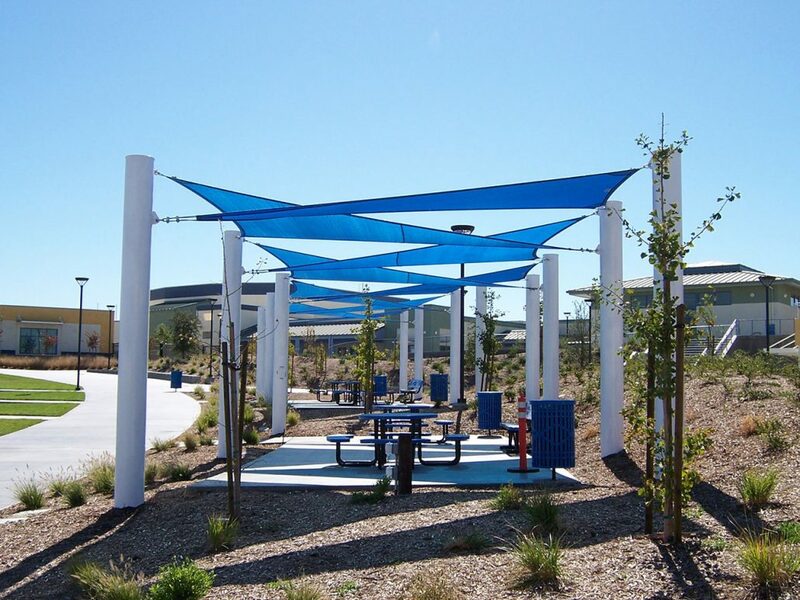 Our shade structures help keep visitors cool and comfortable, allowing them to read, talk, relax and enjoy their day on your site. In addition, our equipment is designed to be aesthetically-appealing so it fits in perfectly with your vision. PlayPower Canada is one of the top landscape furniture suppliers in the nation because we offer quality landscape site amenities which help your ideas come to life. For example, our Shade Structures protect visitors from the sun but also act as a design element. Shade solutions are available in a variety of sizes, shapes, colors and designs. And if you want benches that look great and last for years so visitors can enjoy the space you’re creating, PlayPower Canada offers public site amenities from Wabash Valley, which marry style and function beautifully. Like you, PlayPower Canada cares about creating great spaces for Canadians, coast to coast. Like landscape architects across the country, we care about form, function and style, and we carefully work only with suppliers who offer beautiful site amenities, shade and equipment that provides real value as well as a great look. We’ve researched to ensure every piece we offer meets all standards and can withstand Canadian winters. PlayPower Canada offers quality equipment and site amenities from top brands such as USA SHADE, Wabash Valley, ICON Shelter Systems, and Trekfit. These are trusted brands with innovative solutions and a great track record of creating high-quality items for parks, communities and cities across North America. At PlayPower Canada, we bring you a variety of equipment, and we also offer customization options. We work to create the exact look and style you want with quality pieces, ensuring you serve your clients more fully and look great doing so. If you ever need help, we’re always there for you. If you’d like to learn more about landscape site furnishings and amenities, contact PlayPower Canada today or request a quote on our equipment.